We paint a lot around here. One of my favorite things are these blue mats that T got for me the kids. 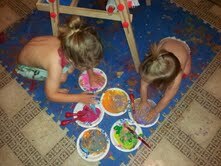 We had all tile floors at our last house, so they were great for cushioning the playroom floor. Now, they're great for keeping paint off my floor! 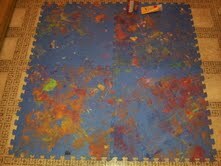 I love that every time the kids paint, new little footprints cover the mats. 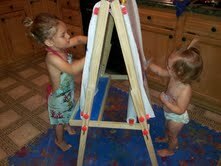 We busted out the easel today. A doesn't paint very well with it yet. So, most of the time, it stays in the playroom. Unless A is napping. But, I was feeling brave for some reason. Z informed me that the yellow was a rainbow. A started out doing really well. She didn't drip much paint, & was actually getting it on the paper. But, the brush wasn't getting it on fast enough. I love this picture. They are both so focused. They really get into it. 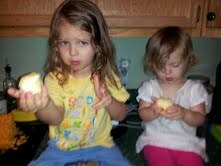 After a good scrubbing, they were ready to eat some apples. Check out those identical little pouty lips. A wasn't feeling well. It seems that she got Z's cold. She was snoring so loud. It was almost like having T home.